No, NASA didn't change your astrological sign. A baker’s dozen? At least. Over the weekend I started seeing links to articles claiming that NASA has changed the signs of the zodiac. I knew immediately what this was about, even as I was scratching my head about a) how this is news, and 2) how short people’s memories are. We don’t want to be dramatic, but NASA just ruined our lives. For the first time in 3,000 years, they’ve decided to update the astrological signs. This means that the majority of us are about to experience a total identity crisis. Apparently, these changes are due to the fact that the constellations are not in the same position in the sky that they once were, and the star signs are about a month off now, as a result. 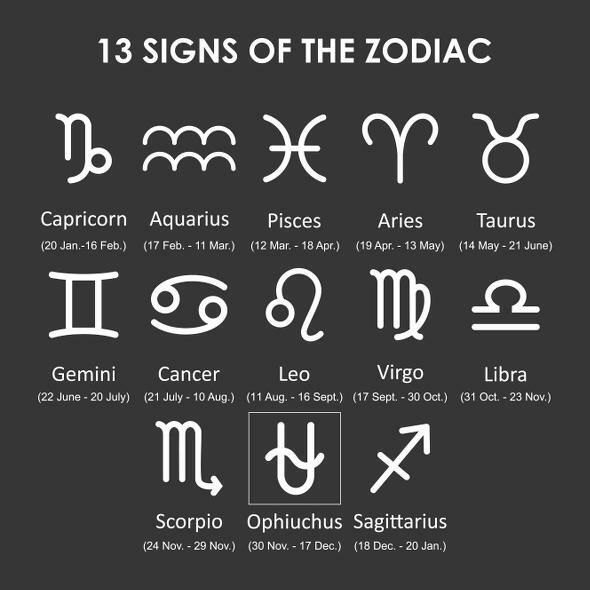 To further confuse things, there is now a new, 13th sign, called Ophiuchus, which those born between November 29 and December 17 are lucky enough to have to learn to pronounce. Cripes. No, no, and no. First off, NASA did not “update the astrological signs.” Second, the constellations haven’t changed. And third, Ophiuchus is an ancient constellation, identified by the Greeks thousands of years ago. So what’s the deal? Well, before we even get started, keep this in mind: Astrology isn’t science; it’s nonsense. It’s been tested 10 ways to Sunday and every time it fails. Even astrologers have come up with tests for it, and it’s failed those. Astrology doesn’t work. The planets, including the Earth, orbit the Sun on pretty much the same plane (from the side, the solar system’s planets’ orbits look flat). From the Earth, it looks like the Sun moves around us once per year. The path it takes across the sky is the same year after year, and we call this the ecliptic. The planets all move across the sky in that same path, too. So, like clockwork, the Sun passes into the same constellations at a certain time every year. You know the names of these constellations: Sagittarius, Libra, Scorpius, Aries, Gemini … the constellation of the zodiac, or, if you prefer, the zodiacal constellations. These 12 zodiacal constellations have been recognized in one way or another around the world, though most countries (and the International Astronomical Union) have adopted a modified version of them known to the ancient Babylonians and Greeks. The thing is, there are more than 12 constellations the Sun can pass through. Some are smaller, or have fainter stars, so they get ignored. The biggest is Ophiuchus, the serpent bearer, which is a huge constellation taking up quite a bit of celestial real estate, and in fact the Sun spends more time in Ophiuchus than Scorpius! Scorpius has brighter stars, and an obvious scorpionlike shape, so it gets better press. So no, NASA didn’t add in Ophiuchus, or change the zodiac, or anything like that. It’s been around this whole time, but it’s been ignored by astrologers. They’re the ones who should take the blame for all this, not actual, real scientists who don’t even think astrology is worth wrapping fish in anyway. Worse, there aren’t really 13 zodiacal constellations. By some counts, there are as many as 21! Not only that, but the Earth wobbles like a top, very slowly, and over centuries and that changes the dates the Sun is in a given constellation. If you were born in late March in ancient Greece, you would’ve been an Aries. Today, you’d be a Pisces. Given that astrology is based on all this, shouldn’t they at least get their basic facts straight before trying to influence your life? The SpacePlace article, Constellations and the Calendar, has been around a while but was recently updated in January 2016, which may have caught some astrology believer’s eye. The article—well worth your time to read—talks about how the zodiac constellations are defined, and how, over time, they’ve changed (as I described above). Apparently, someone didn’t read it very carefully, or didn’t understand it, and wrote that NASA had changed the zodiac. So, yeah. Wow. But this isn’t even the first time this sort of thing has happened: Almost exactly the same story bubbled up in 2011! You know what also rises? The Sun. And when it does, it’ll be because the Earth is spinning, and orbiting around it, and we’ll see the stars and planets and moons doing their thing. And we’ll study them with science and learn their ways, and if people who believe in astrology want to keep looking to the past, well, let ‘em. As long as they promise to remember it. P.S. Another article about this, written by astrologers in September 2016, once again tries to blame NASA for all this. As icing on the cake, they end the article with this gem: “Here’s a deal, NASA: We won’t meddle with the next space shuttle mission if you stop giving the world another astrological identity crisis.” Just a note: The Space Shuttle program ended in 2011.